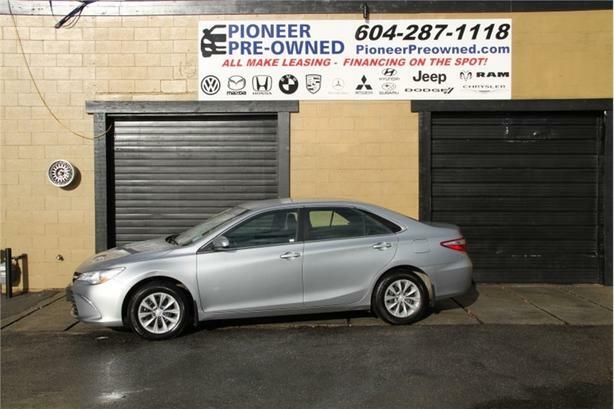 2015 Toyota Camry LE remainder of power train warranty, cheap car to run. Buying a vehicle can be a stressful time. WE CAN HELP make it worry free and easy. Hot Deal! We've marked this unit down $5000 from its regular price of $19888. If you think mid-size sedans are boring, you're in for a surprise with the Toyota Camry. This 2015 Toyota Camry is for sale today in Mission. The 2015 Toyota Camry is refreshed with a bold look, a wider, more sporty stance, and a modern interior. Along with the exterior redesign, the Camry received upgrades to the interior styling and additional safety and tech features. The Camry has been one of the most popular mid-size sedans on the market and this version is destined to be the most popular yet again. Revised steering, braking, and suspension tuning have given the 2015 Toyota Camry a livelier, more responsive feel. Toyota's midsize sedan still qualifies as one of the most comfortable, easy-to-drive midsize sedans you can buy. This sedan has 62727 kms. It's silver in colour and is completely accident free based on the CARFAX Report. It has a 6 speed auto transmission and is powered by a 178HP 2.5L 4 Cylinder Engine. This vehicle has been upgraded with the following features: Rear View Camera, Bluetooth, Air Conditioning, Remote Keyless Entry, Power Seats, Power Windows, Power Doors. It may have some remaining factory warranty, please check with dealer for details. Our Camry's trim level is LE. Camry LE offers a stunning exterior with a sophisticated and feature-rich interior. Standard features include power heated side mirrors with manual fold, projector beam halogen daytime running headlamps, a 6.1-inch display audio, 6 speakers, front bucket seats, a 60/40 folding bench rear seat, air conditioning, a back-up camera, remote keyless entry, Bluetooth capability, and USB/auxiliary audio input jack.